We had some friends over for a barbecue a few weeks back. Among other items, this outdoor soirée featured an epic potato salad (bacon, basil, crushed potato chips, pickles—the whole nine yards). And, like many potato salads, ours was made with a hearty amount of mayonnaise. But, sadly, a guest stopped and stared longingly at the salad, then moved on. As we later discovered, this guest was vegan and could not indulge in this particular side dish because of the egg-based mayonnaise. And Then We Discovered Aquafaba! After some research, we stumbled upon J. Kenji López-Alt's recipe from Serious Eats for a vegan mayonnaise. This revolutionary condiment is made with aquafaba, the liquid inside of a can of chickpeas (aka garbanzo beans). 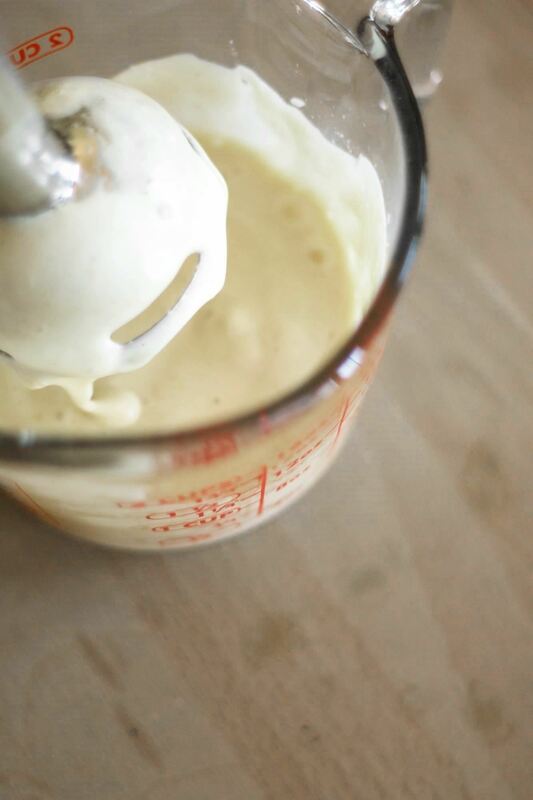 Because of its protein and starch, aquafaba helps to emulsify a mayonnaise without using any egg yolks. Aquafaba creates a light, creamy dressing which can be used for a whole slew of foods. The garlic gave the vegan mayo a certain zing that we found perfect for spicing up vegetarian sandwiches, and it would be a great dressing for light salads, too. First, combine your garlic, lemon juice, mustard, aquafaba, and 12 chickpeas in a tall container. Adding the whole chickpeas during this process helps to further emulsify the mayonnaise. You want the container to be able to fit the head of an immersion blender. If your immersion blender came with a tall container, that is probably the perfect size. Blend the ingredients at high speed until you reach a smooth consistency, drizzling in the vegetable oil slowly. At this point, a creamy dressing should begin to appear as the ingredients emulsify. Next, slowly drizzle in your olive oil and mix using a whisk, making sure to keep a-whisking at all times. Season your mayonnaise with salt and pepper and store it in the fridge for up to a week. After reading comments from Kenji's readers, we found that it is to be expected that your mayonnaise may be a bit on the liquid side. If your mayonnaise is too runny and does not come together at all, it may have not emulsified (in which case, you may need to start from scratch). We liked the vegan mayonnaise better! The garlic and the chickpea liquid give this mayonnaise a light, grease-free feel and a bit of a spice that makes it a wonderful addition to a vegetarian (or vegan) sandwich. Regular mayonnaise is inarguably richer. It's more dense and custard-like and mounds up, holding its shape more naturally. There's a creaminess to regular mayo that just isn't there in the vegan version. That creaminess we find to be important in dishes like our potato salad. Vegan mayonnaise, on the other hand, has a taste that is also good but uniquely its own. It may mound up if you force it with a spoon, although there's a good chance the texture is just going to be more liquid-like (unless you have a magical touch like Kenji). The taste is spicy and without a doubt, sublime. We'd actually opt for the vegan mayonnaise with lighter, veggie-based items like the tea sandwich. Overall, we were pleasantly surprised and thoroughly impressed with this recipe for vegan mayonnaise. It's something we know we'll whip up again in the near future (and not just when there's a vegan in the house). Perhaps, as we hone our technique a bit more, the mayonnaise will emulsify and those beautiful stiff peaks will form. We'll keep working on it. Got any vegan cooking hacks you'd like to share? Let us know in the comments below!